You are here: Home / Random Thoughts / November 19, 1863: One of the shortest, yet most eloquent speeches ever given. November 19, 1863: One of the shortest, yet most eloquent speeches ever given. Given on this day in 1863 one of the shortest, yet most eloquent and powerful speeches ever delivered. Pennsylvania’s governor, Andrew Curtin, charged attorney David Wills to care for the dead of the battle of Gettysburg. Wills purchased 17 acres of farm land to turn into a cemetery to honor the more than 7,500 who died in that battle. Wills invited one of the most well respected speakers of the time, Edward Everett, to give a speech at the dedication ceremony. 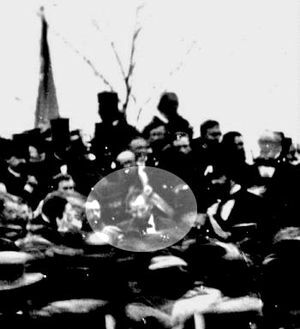 Almost as an afterthought, just two weeks before the ceremony Wills also invited Abraham Lincoln to give “a few appropriate remarks” to commemorate the fallen. Wills’ speech lasted almost 2 hours…Lincoln’s lasted 2 1/2 minutes, yet it is still remembered and resonates today. Thank you, Mr. Lincoln, and may democracy and freedom for all continue to be this nation’s guiding principles.